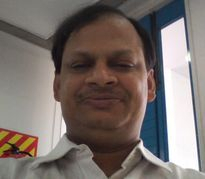 Ph.D from ICT, Mumbai,ORG CHEM, Prof. S. SESHADRI, 25+ years in industry( API), mostly multinationals, process development in companies like Hoechst Marion Roussel(Sanofi aventis), Searle, RPG, Innovassynth, Glenmark, with exposure to basic research at SEARLE under Dr Nagarajan (Director Ciba), Tech transfer in plant eg deltamethrin 3 tonnes in RPG, bulk drug gmp (only 7 months) in Hoechst Marion Roussel(SANOFI AVENTIS), Custom syn in Innovasynth(SANDOZ, Basel, BASF Germany), exposure to natural pdts, drugs int, vet drugs, and some exposure in agro.speciality chemicals, flavours and fragrances, nutraceuticals and mettalocenes. ability to deliver products in the production plant(atleast 35 in career). Congratulations! Your presentation titled "Anthony Crasto Glenmark scientist, helping millions with websites" has just crossed MILLION views.